Coca-Cola South Pacific, a division of the global soft drinks giant has launched two new Fanta soft drink products called Jelly Fizz and Sour Tingle. According to Inside FMCG, Jelly Fizz is claimed to be a soft drink blended with juicy liquid jelly pieces and is recommended to be shaken 10 times before opening so it releases the jelly. The Sour Tingle variant, meanwhile, is said to be “loaded with extreme sours and tingles”. 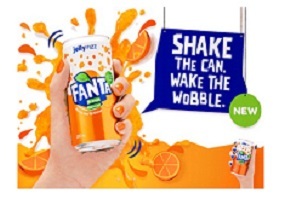 “What we know about our consumers is that they crave novelty and new interactive experiences”, said Fanta brand manager Josh Gonski. “While disruptive innovation and fun has always been at the core of the Fanta brand, these new products are completely different to other drinks on the market”. “Teens know Fanta better than anyone so we wanted to shake things up and put teens at the heart of the campaign”, he added. Fanta Jelly Fizz is available in orange and raspberry flavours in packs of 4 x 200ml cans and singles cans, while Fanta Sour Tingle is berry flavoured and is available in packs of four cans.